Splits the triangles contained in table tableName into smaller triangles according to certain z-values with respect to the classes given by the various varArgs arguments. Throws an error if a Geometry is found which is not a triangle. 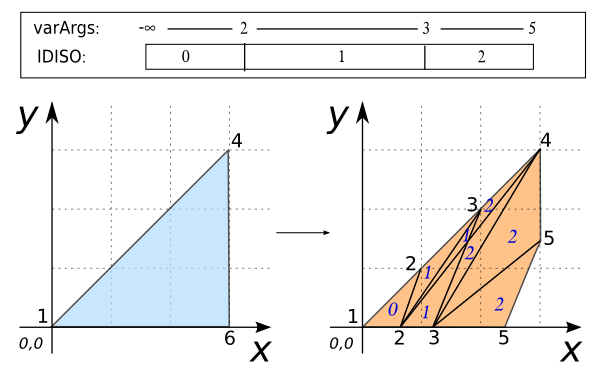 If column names z1, z2 and z3 are not specified, the z-values of each Geometry (in order of appearance) are used. Otherwise, the values contained in these columns are used. 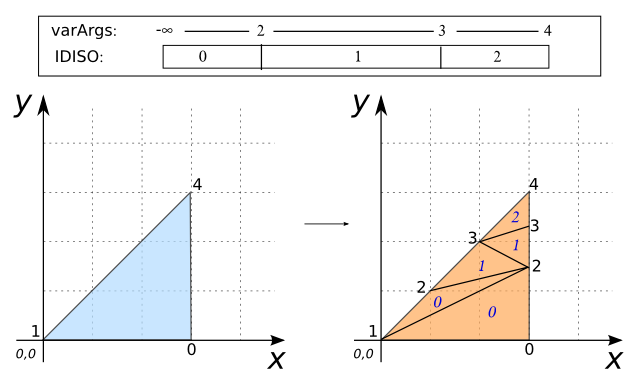 The various varArgs arguments (you may provide as many as you like) define the classes according to which the triangles are split. The interval from negative infinity to varArgs1 is assigned an IDISO of 0, from varArgs1 to varArgs2 gets an IDISO of 1, etc. -- than the largest class value (5). -- An error is thrown if the Geometry is not a triangle.